I’ve got nice childhood memories of going to the Re-Store in Leederville with my dad. He’d always get some salami, mortadella, ham and a loaf of crusty Italian bread. Now, as an alleged adult, I go to The Re-Store and I’m like a kid in a candy store – well, a candy store that is filled with cured meats, the best lunch rolls you’ll find in Perth, handmade pastas and great booze that is. Walking into the store is intoxicating, the hustle of bodies crowding around the glass cabinets of olives and cheese whilst the smell of curd meats wafts up your nose and draws you in. I freakin’ love this place. My partner’s parents gifted us a voucher for Christmas and it’s a gift that keeps on giving! 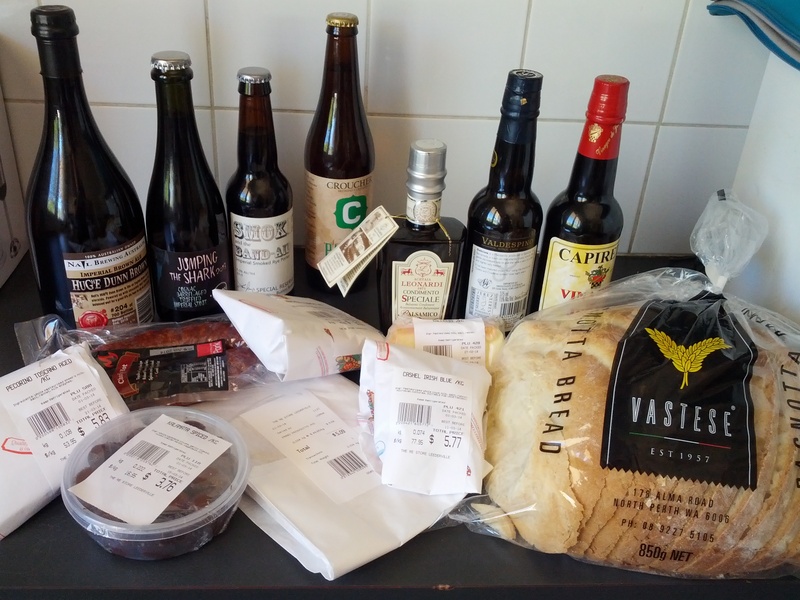 We picked up olives, cheese – taleggio, manchego, cashel Irish blue and pecorino, prosciutto, chorizo, sherry vinegar, proper balsamic, several beers including Nail Huge Dunn Brown Ale, and some fresh bread to accompany it all. It’s hard to believe you can go to one place for a pasta maker, a bottle of Moon Dog beer, thinly sliced Spanish prosciutto, my favourite rubbery taleggio cheese, authentic balsamic and countless wine and spirits. In short, get into The Re-Store. It’s amazing!